This is probably the most well known tick disease as it is the most common vector borne illness in humans according to the CDC. Lyme’s Disease is caused by a bacteria called Borrelia burgdorferi that is transmitted by the tick to the host during feeding. 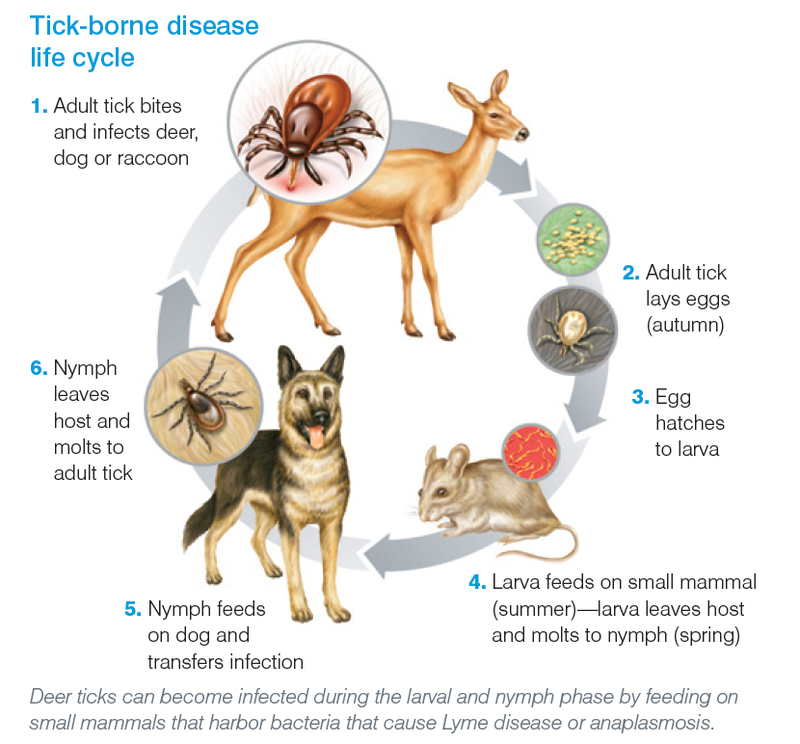 The most common tick to spread Lyme’s Disease is Ixodes or Deer Tick. Symptoms of Lyme’s Disease can be many but the most common are fever, lethargy, joint pain/ swelling/ lameness and swollen lymph nodes. In rare cases the bacteria can cause blindness, heart disease, neurologic disease and even kidney failure. Symptoms could take weeks to months to develop after being exposed and the stereotypical “bull’s eye” rash is often not present, making diagnosis difficult. A blood test is performed to diagnose Lyme’s Disease and often times needs to be repeated to evaluate for successful treatment. Treatment involves antibiotics, sometimes for extended periods of time. Additionally we may need other medications to support symptoms such as pain, fever and kidney disease. There is debate as to whether some tick diseases including Lyme’s Disease, can cause chronic illness. The jury is still out on that question but we definitely have dogs that appear to have chronic issues and often times have a “flare up” up symptoms and respond to therapy with repeated use of antibiotics and NSAIDs. According the the most recent CDC map (2017) of human reported cases the incidence of Lyme’s Disease in NC is low. However, it is high in surrounding northern states including Virginia. As wildlife migrate disease prevalence can change rapidly making what was once a rare disease a common one.